We all know Justin Trudeau has lied about this affair. I’d love to see a newspaper list all his lies in on article. With additional paragraphs for lies and falsehoods told by his officials. On second thought we may need pages not paragraphs. Excellent suggestion Joe. They do that south of the border with Trump. It would be the worst of the worst if someone compiled that and put it on a public platform. It could be the thing to keep the heat on the Big Phony. “Somebody gonna get a hurting real bad. I’m not gonna say who, but I think you know. Somebody gonna get a hurting real bad. SOMEBODY. ” In October. Justin is a “gaffe machine”. The spineless Liberal MPs, especially the women, got elected on the Trudeau brand. And they will be defeated on the now exposed Trudeau Brand. Dead Man Walking. Dead Party Talking. You have to wonder how long the so-called unbiased media types will tolerate their colleagues, using the euphemism, ‘anonymous sources’, to help Trudeau’s PMO smear JWR & Dr. Philpott. They don’t seem to realize that the likes of most CBC hacks, Canadian Press, Mia Rabson, Joan Bryden, Glen McGregor Chantal Hebert, Susan Delacourt, Althia Raj, CTV News chief Joyce Napier. her hubby Neil MacDonald and a host of others acting as Katie Telford’s gofers have brought them all into disrepute. I find it hard to believe that legit journos/pundits, can stomach this and have failed to call out their colleagues. Anonymous sources indeed! There is still time to eject PM Zoolander and disassemble his despicable campaign against the rule of law… and that is the ONLY way forward for the Liberal Party. Not gonna happen. They are already strapped into the spiraling down toward inevitable defeat and humiliation. You would think, but I’m not convinced. Not at all. Unfortunately. 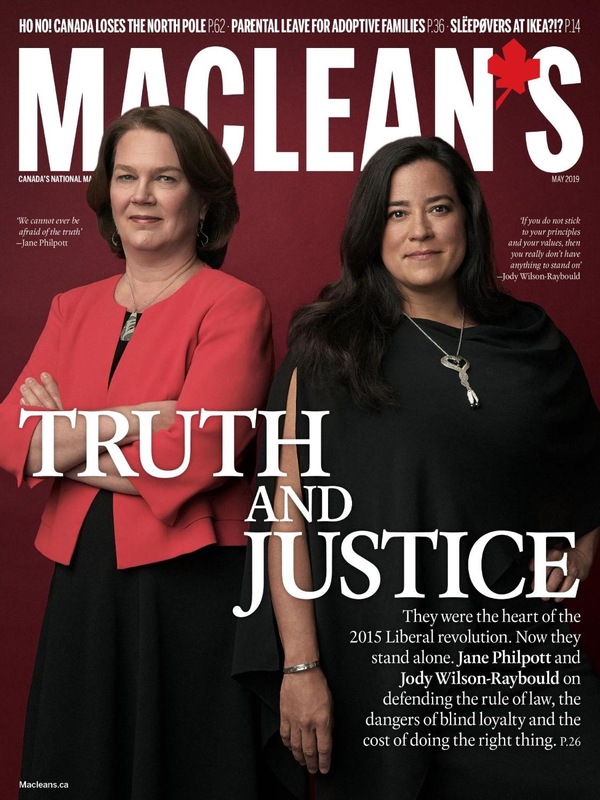 Why is CBC carrying the water so hard for their anonymous “PMO-approved” smearer, and the ridiculous claim that Wilson-Raybould wanted to interfere with the new AG? Is it to protect their preferential access to the PMO (and PMO leaks)? The anonymous smearer has contorted the JWR’s statement that she would have to resign on principle if a directive to the DPP was issued by the new AG, to a faux claim that that amounts to a condition and attempted political interference. The CBC itself reports that once JWR resigned, the “condition” disappeared. It was NOT a condition. Both CBC and the leaker know that because Trudeau has not waived cabinet confidentiality over the period, that JWR is extremely limited in how she can respond to the absurd accusation. But there is the CBC, aiding and abetting an anonymous smearer, in another attempted character assassination. Prominent news organizations in Canada throughout this scandal have granted individuals anonymity for the purpose of character assassination. Its ending is unfortunately weak – I think he would have done better to have put his discussion of the prosecutor’s right to decide on DPAs earlier, perhaps at the same place he says “Prosecutions are not policy choices”, because I find that putting it at the end dilutes his main arguments. Aside from that, however, I find he summarizes everything perfectly. Well Vancouver…. Coyne is one of the best journalists of his generation, if not in Canadian history. Feel free to write your own Op Ed. If you find it’s effective as is, though, so much the better. I hope everyone will. Absolutely, but allow a decent interval so that most people won’t be able to put 2 and 2 together. LOL! I saved that column. Best one I think he has ever written, and almost every point he makes sounds like a courtroom argument. You might be right about the ending, but the only reason that stands out is because the whole thing actually does read like a summation, doesn’t it? That said, I’ve never been a big fan of his. Too much of a Red Tory for me. Red Tory? In the past two elections he openly endorsed the Liberals, and went so far as to *resign* as Editor of the Comment page in the National Post because they were endorsing the Conservatives instead. That’s a significant part of what makes this article so – well, *significant*. Really? I didn’t know that (and probably should have). But then why does the CBC keep using him as the ‘token conservative’ on so many of their panels? Andrew Coyne is the uncle of one of Pierre E. Trudeau’s children (not Justin)(google Deborah Coyne). Not that I think this affects his opinions. I like that Andrew kind of jumps around from right to left to right depending on a given topic. I don’t always agree but I do find him consistently interesting. Many of us go through this experience where we join a political party because we’re interested in public policy and want to make a positive difference. Then you join and at some point realize just how insular these parties are, more concerned with the inner politics of the party itself than with the party’s presumed raison d’etre (ie the betterment of the country). I had that realization many years ago and I know many others have. It’s just depressing, I don’t know what else to say. It’s no wonder that so many talented, amazing people in the world of business refuse to get involved in party politics. Take the underevolved out of the equation and it would be great! Trouble is, how many would be left? Perhaps its a sign that my vision is fading, but that picture of Philpott strangely reminds me of actor Michael McKean. Am I nuts? Perhaps I’m simply craving some Spinal Tap. Whenever I see “Mr. Selfie’s” face on TV or hear his voice on the radio, I almost break my finger in my haste to change the channel or the station. Am I alone or do others have a similar reaction? A friend did it with Harper. She now does it with guess who? I do it with Elizabeth May. But Fred, she can’t be all bad. After all, she used to be PCPC! But I’m baised. I got rid of my TVs about six years ago. This lets me read more and I never have to see Trudeau or his minions. I do the same. His voice and manner of presentation is absolutely grating–and that’s not even taking into account the nonsense that he regurgitates. First of all, Chretien would never have let this happen. He would have pragmatically kept JWR in Justice. This was always about JWR losing her dream job. Period. SNC never had the LPC over a barrel. But if he had shuffled her, he would have said, “I ‘ad to move ‘er to veterans to strengthen ‘er weaknesses on military. Because [a] good future priiiiime minisster must take dat less glam’ours files. Like I did with Indian affairs.” (a perfect deflective gaffe, that stokes JWR’s considerable ego). Was never a fan of Chretien, but he would not have done any of that. For one thing he knew that anything of the kind was politically stupid, and had a huge downside and very little upside.